As police and protesters continue to clash over the Dakota Access Pipeline in the United States, Unist’ot’en Clan Spokesperson Freda Huson visited Concordia University Saturday morning with a message of her own. In 2010, Huson’s community, the Unist’ot’en Clan of the Wet’suwet’en First Nation in northern B.C., constructed a permanent camp to block extraction companies from building oil and gas pipelines through their land. 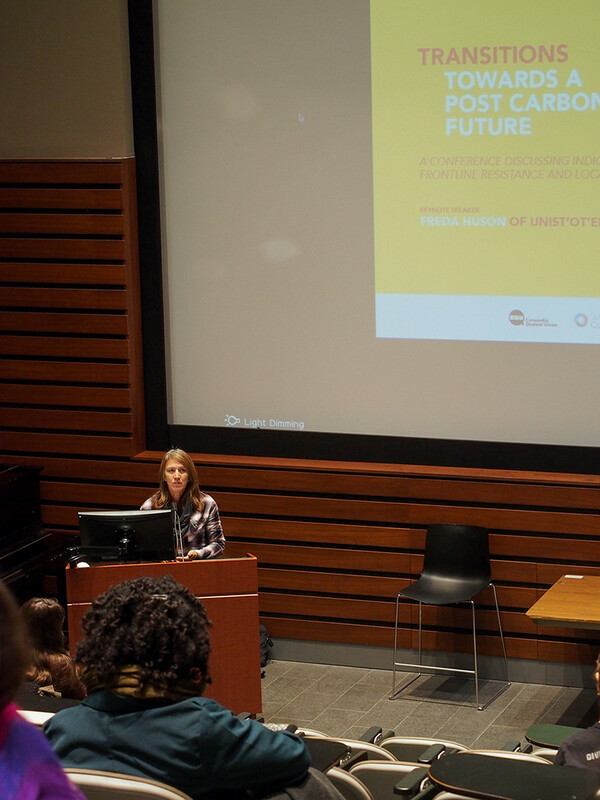 Huson’s keynote presentation on Saturday headlined Sustainable Concordia’s Transitions Conference, an array of presentations advocating society’s transition away from industrial energy. The conference’s motif of Indigenous and frontline resistance in the face of resource extraction projects comes at a time when tensions are building over the Dakota Access Pipeline in North Dakota. The $3.7 billion DAPL project has proposed to transport crude oil from North Dakota’s Bakken oil field to a refinery plant in Chicago–through the Standing Rock Reservation in the United States. Six years ago, the Unist’ot’en Clan built structures to stand in the way of resource extraction companies, but the permanent camp has also served to reconnect the people with their community, said Huson. For the past five years, Huson has spent almost $30,000 of her own savings living out on the territory, and resistance hasn’t come cheap—or easily. But even though it’s costly, Huson believes that living out there and travelling across Canada to speak is worth it. Impending pipelines aren’t the only struggles facing the Unist’ot’en Clan, added Huson, and over time, her community has noticed the number of salmon plummet. The impacts of climate change are starting to manifest, said Damon Matthews, an environmental scientist and associate professor at Concordia. Matthews spoke after Huson on Saturday, warning that the global economy must move away from carbon within the next 50 years to have any chance of meeting the aspirations of the Paris Agreement. More than 50 countries, including Canada, have signed the Paris Agreement, pledging to curb greenhouse gas emissions and keep global temperature from rising more than 2 C.
To meet that promise, the government must make it easier for people to make the right environmental choices, said Matthews.